What Is a Better Insulator: Paper, Glass, Plastic, or Styrofoam? Dot Summer began writing in 1985. She has been published in magazines such as "Working Mother" and "Macintosh Buyer's Guide," and she worked as the managing editor at a corporate communication company. Summer received her Bachelor of Science in nursing from the University of Florida and a Master of Arts in business and computers from Webster University. The thermal conductivity of a material determines how good an insulator it is. The official definition of thermal conductivity is the quantity of heat transmitted through a unit thickness in a direction normal to a surface of unit area, due to a unit temperature gradient under steady state conditions. A simpler way of saying this is: thermal conductivity is the ability to conduct heat. The best materials for insulation are the ones with the lowest thermal conductivity. Thermal conductivity is commonly described in terms of how fast a unit of heat, called a BTU, or British Thermal Unit, can travel through 1 foot of material in one hour due to 1 degree F of difference. Glass is far inferior to paper, plastic and Styrofoam in terms of insulation. Thermal conductivity in terms of BTU/(feet - hour - degrees F) is 1.82 for glass, 0.09 for paper, 0.06 for Styrofoam. The conductivity of plastics varies depending on the materials: for polypropylene and polycarbonate, the thermal conductivity values are 0.69 and 0.35, respectively. Paper, glass, plastic and Styrofoam are common materials used in containers holding hot beverages. Considering containers of the same size, a glass container is the least effective for keeping a cup of coffee warm. Though not commonly used in the United States, using elegant glass cups for serving coffee or other hot drinks is common in Austria, Spain and India. It’s a common sight to see people walking around carrying coffee in paper or Styrofoam cups. 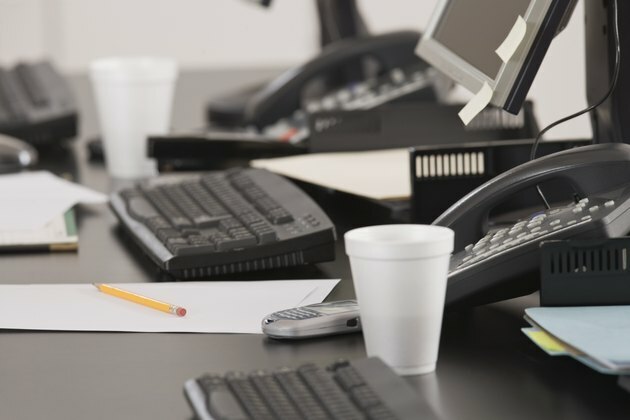 The insulative values of paper and Styrofoam aren't that different, but Styrofoam cups generally are much thicker than paper ones, so they keep your coffee hot longer. However, drinking from a Styrofoam cup is unappealing to many people because it’s not the most eco-friendly choice. Paper biodegrades much faster than Styrofoam. Many coffee travel mugs are made of hard plastic, either polystyrene or polycarbonate. Their insulative values are higher than glass, but lower than paper. Plastic travel mugs are tougher and thicker than either paper or Styrofoam cups. This not only improves the insulative ability of plastic mugs, but also makes them a safer choice in terms of driving with scalding hot drinks.